The hard part about traveling is the travel. Airport lines are longer than Chinese dragons, and when you finish one, there is another through security, then another through immigration, then another waiting to get on the plane. No one helps lift your luggage, so get a cart if you can find a free one. No one answers your questions nor wants to. When our charter flight arrived in Santiago at 6 p.m., there was no one in the international wing of the airport. We walked for miles until finally found a sign that said immigration with a directional arrow that looked alive. Other similar signs had pointed us to locked doors. Chile charges a one hundred entrance fee, one time only til your passport expires. Our flight on Lan had been three and a half hours with a bag of peanuts and an alfojar (cookie). Most of us dozed, missing the sleepy sway of the Endeavor and the challenges the ice and snow and the sea proposed every day in Antarctica and made us feel brave and accomplished. Friends hugged new friends, exchanged emails, and wondered when we’d meet again on another Lindbad excursion. Photo: The last early-riser's muffin, as we cross Cape horn. We said we’d miss being told what to do when every day - our ears were always cocked for Tim’s or Lisa’s latest announcement/reminder. There was so much to learn from the experts on board in their lectures and slide shows. We kept ourselves dressed in the all weather red jackets and caps because we spent more time outside on deck than inside, positioning our cameras to catch something - whales, sea birds, dolphins - and many of us sat or stood on the Bridge where the captain and crew answered our endless questions as they worked with high end sailing equipment. Everyone had to be alert to spotting a whale blow or its dorsal fin cutting the surface of the sea like a blade cuts jello. Our return to Ushuaia was much quicker than anticipated since the Drake Passage challenge was more kitten on this crossing. The Captain kept his pedal on the metal, so to speak, to skirt through the areas where gales were scheduled to appear or might pop out of the blue with no warning. Photo: The first sunset in 11 days. We scooted into the Ushusaia dock in time to watch our first sunset since we left (we never saw the sun rise and set in Antarctica, nor any moon, and daylight only dimmed slightly in the night hours), then nestled up to the large Norwegian ship, the Nordnorge, with which we had partnered in the rescue of the passengers and crew from the Explorer. They were preparing to embark on another trip. Photo: The rescue ships together again in Ushaia Port. At our Captain’s final dinner, he explained what had finally been put together by his fellow maritime officers who shared in watching the great Explorer go down. He said "the little red ship" (first commissioned by Lindblad) had been the greatest lady of all. She was the first to ever be built for excursions of scientific-nature types, she had plied the Southern Seas for four decades, and had been sold from the Lindblad fleet two years ago. The new company was more interested in bargain travelers and less in the ship's care, so it was a downgrade for the Explorer, and yet, Captain said, she appeared spiffy and beautiful as she listed in the waters of Antarctica, not letting anyone take her dignity and courage away from her. He believed that she was disturbed of the rumors that she would be sent to dry dock in India and then dismantled. She knew her home was in the seas of Antarctica. Then by chance, a miscalculation, she was wrecked by a wayward ice berg. A large one. (Maybe someone wasn't vigilant that night.) After first shutting down as water flooded through the holes into her engine room, she was able to restore her energy powers. Oh, she had been wrecked two other times in her career, but never died. This time, she gave one last burst of adrenalin, enough to allow all passengers and crew to disembark safely from her hold - the Explorer captain finally having to give up the ship - she watched sister ships arrive to rescue the refugees; then she went with the tides into powerful ice floes she had so well known, and fell beneath the sea when no one was looking. No one saw her final moments. Our ships crew and staff were devastated by her loss, because many had worked on her and known her decks, but they were proud of how she went, with the dignity of a grand dame of the seas. 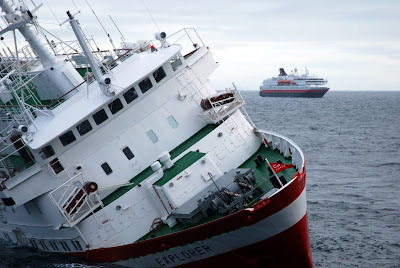 Photo: The end of the final voyage for MS Explorer. Rescue ship NordNorge can be seen in the background. For more text and pictures of the sinking, click here. At yesterday morning’s departure from the Endeavor - as the crew bustled around to clean up for the next 100 passengers arriving that afternoon - we knew in our hearts we had experienced a unique "viaje." But as we peeked out the portals of our tiny rooms, the sun was blocked from its rise by a skyscraper sailing vehicle pushing tight on the other side of the dock. (It was so big, the sailors took 15 tries to throw the rope to secure her at the jetty.) In fact, this ship was 14 or 15 stories high - enormous - filled with people coming out on their private decks with bathrobes on to watch the entry into Ushuaia. Awful, we thought, those celebrity cruises with casinos and entertainment that meant you never had to get your feet wet or your nose cold. They were only rounding Cape Horn, not braving Antarctica, thank God. We turned back to see our tiny vessel and smiled at how small she looked against the new monster ship. We knew what a giant she was. 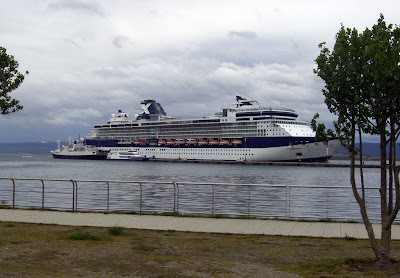 Photo: The "monster" is a Celebrity Cruise ship. The Endeavor is that tiny one at the left end.